The newly completed woodland trail and fishing access point are the latest installation in a five year project at Mianus River Park, CT. 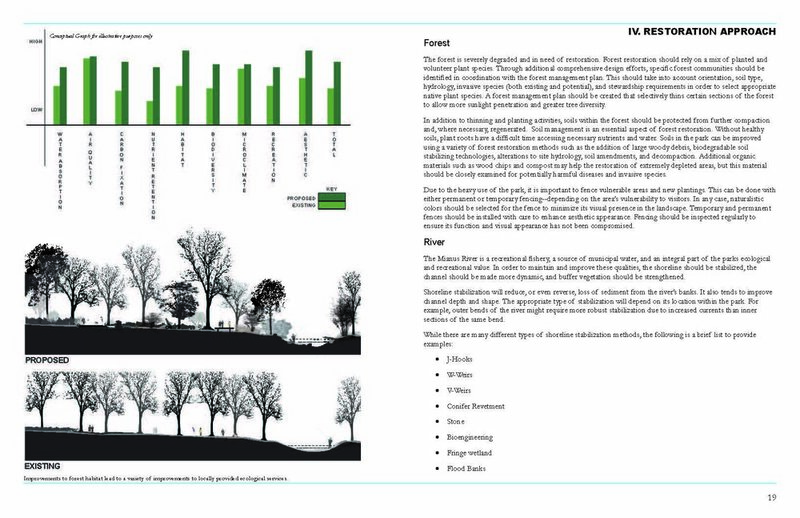 Following recommendations from the Mianus River Park Ecological Master Plan which we developed in 2013, our team set out to design a better entrance to the park that would enhance the user experience while protecting the local environment. In the past, high visitation rates and excessive foot traffic have caused ongoing shoreline erosion, sedimentation of the riverbanks, and loss of understory vegetation. In Stamford, Connecticut, community members and local environmental stakeholders expressed concerns over the degradation and pollution of Cummings Pond, which has been altered over recent decades by urban development and sediment deposition. In response, our team has provided research-driven consultation and ecologically-principled recommendations that take into account the larger context of the pond. The Mianus River Park is a beautiful 400-acre recreational treasure in Stamford, Connecticut. The rolling Mianus River threads through the middle of the park; full of wildlife, dense forest, and colonial-era stone walls. In this highly developed area of Connecticut, the Mianus River Park has become a pedestrian refuge and overuse has caused significant damage. Because of increasing ecological strain and degradation of the park, the City of Stamford, in tandem with Trout Unlimited, turned to us for an Ecological Master Plan (conducted in 2012) to restore the environmental health of this valuable natural preserve. After a year of analysis, we created a long-term Ecological Master Plan that integrates human use of the park with regenerative and sustainable ecological practices. Forest: The Mianus River Park forests are almost entirely deciduous, comprised of trees that fall within the same age range and a limited number of species. Over time, this has created a homogeneous environment in which trees form a dense, single canopy that blocks sunlight and hinders soil regeneration. An ecologically healthy forest needs a mid-level canopy to successfully support native plants and animals. Human and dog traffic, and deer grazing have also added to the severe degradation of forested areas resulting in a lack of plant regeneration. We recommended both tree thinning and new plantings to break up the upper canopy and diversify species, as well as soil regeneration to restore the forests. Native plants are the best solution for creating habitats that help native wildlife thrive. Plants should also be selected based on soil type, shade, and available moisture. We also strongly recommended using fences in highly vulnerable areas and around new plantings since the park is so heavily used. River: The Mianus River is central to the park’s popularity. It serves as both a recreational fishery and a source of municipal water. Explosive visitation growth to the park and its river, especially for fly fishing, has taken a heavy toll on the river’s banks. Erosion along the shoreline has caused deep sections of the river to fill with sediment from the riverbanks. Important ground-level plant life is also absent because of excessive foot traffic. Shoreline stabilization is vital to restoring the riverbanks and will stop the rapid erosion and buildup of sediment in the river channel. We recommended putting in place a combination of the following river stabilization tools and systems: weirs, j-hooks, conifer revetment, large stones and boulders, bioengineering, fringe wetland, and flood banks. A robust native plant community along the banks would provide important food sources to aquatic species, moderate temperature, and reduce erosion during floods. The river’s edge should be replanted, protected from foot traffic, and visitor access points should be formally established to restore shorelines, which ultimately restores the river and ecosystem as a whole. Trails: The popularity of the Mianus River Park has surged over the last decade. With land being used for hiking, fishing, dog walking and mountain biking, heavy visitation has caused soil compaction, eroded shorelines, and damaged hiking trails. We determined there were many redundant and unofficial trails created by hikers and bikers, and that the excessive amount of trail in the lower section of the park could not sustain healthy ecosystems. It was therefore recommended that 50 percent of existing trails be shut down for full restoration of native habitats. In wet areas, especially along river trails, we proposed elevated walkways to protect plant life and reduce erosion. One Nature was hired to develop an Agroecological Master Plan for the Bee Farm, a beautiful 160-acre property of pasture and woodland in New York’s upper Hudson River Valley. This master plan proposed an ecologically sound maintenance program for existing field habitats: a strategy for managing forest areas, recommendations for the maintenance and definition of pathways, and the best locations for future building projects. Farmscapes are inherently complex ecological systems. Unfortunately, the 20th Century saw the decline of biotic integrity of cultivated lands due to increased monoculture plantings, chemical use, and short term thinking. Developing a solid farm master plan based in 21st Century scientific knowledge is a good first step towards returning land to a healthy state. The goal of the Ash Creek Estuary ecological planning effort is to establish a framework for the systematic development of a comprehensive restoration plan for the enhancement, restoration, use, and management of the Ash Creek estuary.